Deutsche Bank’s chief international economist warns that inflation risk is rising, posing the main threat for the investment outlook. Some analysts disagree, although the Treasury market seems to be pricing in this risk. 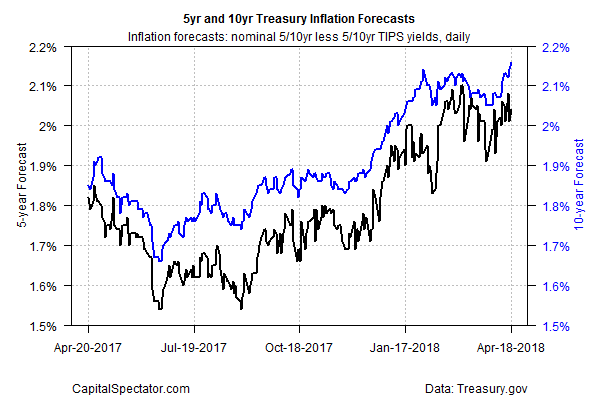 The implied inflation forecast via the yield spread for the nominal 10-year rate less its inflation-indexed counterpart ticked up to 2.16% on Wednesday (Apr. 18) – the highest since the summer of 2014, based on Treasury.gov’s daily data. That’s still a subdued level compared with the post-recession peak of roughly 2.60%. But the upside bias in recent months suggests that the unusually low inflationary tide may finally be turning. Inflation has firmed up, but there’s still room for debate about the near-term outlook for pricing pressure. Yes, the dollar has weakened over the last year, but the slide follows the sharp 2014-2015 rally and so the US Dollar Index is unchanged relative to its close in 2014. Keep in mind, too, that the official inflation data is relatively contained. But to Slok’s point, the upside trend appears to be gathering momentum, albeit on the margins. Notably, the year-over-year rate of core consumer inflation (excluding food and energy) ticked up to 2.1% in March, the highest in more than a year.